I love the holidays, and I particularly appreciate Christmas decorating that goes all out. It’s like putting your home into a party dress to show off for guests. It’s important to make sure your house looks great both day and night. Go ahead and string those lights, but make sure to add some other decorations that will look good when the sun is out. I love using strings of lights to outline architectural features and the branches of deciduous trees that are simply magical at night. For daytime eye candy, use garlands of greenery around your door and porch railings for a lush entryway — it’s so much more complete than just a stand-alone wreath. For the ultimate experience, try going with fresh evergreen elements. The smell of pine that greets your guests and texture of the branches will be unmatched! For best results, make sure your ornaments match your personality and the overall interior design of your house for a pleasing result. Decide if you are going for a formal, elegant look; an arts and crafts style; a contemporary, whimsical approach, or something else all together. Color schemes and combinations are just as important here as in your everyday interior design, so be sure to have a plan. Lastly, decide if your tree topper will be an angel, a star, or a beautiful, sparkly spray of stems. For families with kids, I also love using multiple trees to capture all the family’s favorites: a kids’ homemade ornaments tree, a sports teams tree, and another for hobbies and personal collections. 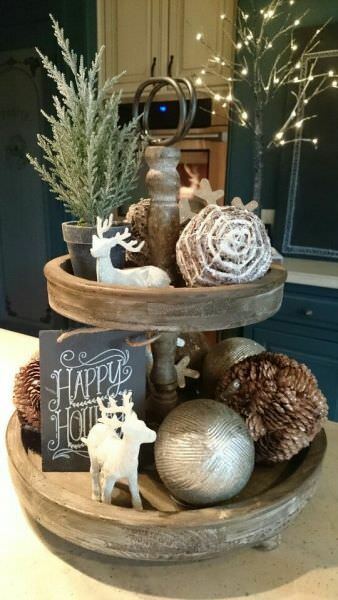 They don’t all have to be full-sized trees… 3 feet or less give tabletops some glam. Have fun with it! Christmas only happens once a year! With so much attention placed on the Christmas tree, it’s easy to forget to set a special table for your dinner parties! If you have holiday dishes, show them off in your dining room table settings and try displaying the set table throughout the season. Be sure to update your everyday tabletop appointments with a holiday look: a rich velvet runner, nutcrackers, or a bowl full of ornaments are all great choices. You can accessorize with fragrant balsam and pinecones, or consider grouping an array of glowing candles to add warmth to your tablescape. • Kitchen: Swap out everyday dish towels for ones with a holiday theme— or just red ones. I also like to highlight seasonal food, so display your homemade cookies on your favorite Christmas tray. • Family Room: Put out bowls of unshelled nuts with nutcrackers to keep a seasonal snack at hand while watching TV. • Bathrooms: In addition to festive hand towels, a candle, or diffuser, a holiday-appropriate scent is a great idea. My favorite is fresh pine or cinnamon apple pie! • Children’s rooms: Get those visions of sugarplums dancing in their heads with a mini-Christmas tree or a bedside music box that plays a favorite carol. Stockings can be hung in their rooms as well as an advent calendar where they open a surprise every day. • Elf on the Shelf: I absolutely love this one! If you don’t know what it is, Google the idea and have a blast with your kids and grandkids. You’ll get the best behavior of the year out of them knowing the Elf is watching! p.s. Here are some delightful tips on new ways to “move” your Elf! If you need assistance during the holidays (or anytime) with your interior design planning, please stop by our website. At Nicole Arnold Interiors, we offer on-site consultations to bring your ideal home or office design to fruition, whatever the season may be. HAPPY HOLIDAYS! Nicole Arnold is a Frisco-based interior designer specializing in creating residential and commercial interiors that reflect her clients' personalities, lifestyles or corporate images. Her firm, Nicole Arnold Interiors, offers a full range of interior and exterior design services, guiding and providing full service to clients throughout building, renovating and furnishing one room or their entire home or office.